Bells Moving and Storage has been moving families throughout Tasmania and mainland Australia for nearly 70 years. Broughton Cornish first established Broughton Cornish Removals and Storage in Hobart in 1948. 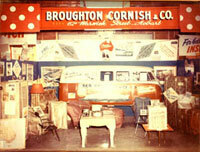 Broughton Cornish was the first Removal Company to use the airline TAA to fly furniture to the mainland. Broughton Cornish also was the first Removal Company to use the ships Empress and Princess to move furniture to the mainland. Bells Removals and Storage continue this tradition now using the TT Line to move client’s furniture to and from the mainland. Linley Bell married Broughton Cornish’s daughter Leonie (nee Cornish) and went to work for his father-in-law until Broughton Cornish sold his business to Sir Gordon Barton the founder of IPEC. Linley took the family and moved to Melbourne to run IPEC for Sir Gordon for 12 months. Linley and his family returned to Tasmania and Linley went to manage Greens Removals and Storage for the owner Stewart Spencer. Linley managed Greens Removals for 12 years until Linley and Leonie decided to go in to business and purchased Auto Carriers. Auto Carriers Pty Ltd was established in 1923 by Mr Arthur Hay, a well respected Hobart gentleman. The company was the first delivery business to deliver parcels using an automobile within the Hobart area. After purchasing Auto Carriers, Linley Bell and his wife Leonie expanded the business to include courier work and the business became known as Prestige couriers and furniture removals. Linley and Leonie sold the parcel and courier division in the late 80’s to concentrate more on the removal and storage part of the business. Chris (Bell) worked with his father for a number of years prior to starting his own company Chris Bell Removals. Chris Bell Removals specialised in Interstate removals door to door. In 2003 the business’s merged to create Chris Bell & Bells Moving and Storage. The merger of these two successful removal companies, now owned by Chris and Jane Bell, ensured the third generation of Bells continues the success of the business in to the future.